When news broke that several advertisers were withdrawing ads from Sean Hannity’s show this week, many in the media world wondered whether the Fox News host was headed for a Bill O’Reilly repeat. In April, O’Reilly, then the network’s most visible talent, was fired by Fox when advertisers fled his primetime show, “The O’Reilly Factor,” en masse after a sexual harassment scandal involving multiple reported victims became public. Hannity hasn’t been accused of sexual harassment, but he provoked a backlash this week over his continued peddling of a right-wing conspiracy theory surrounding the murder of Democratic National Committee staffer Seth Rich in 2016, despite outcry from Rich’s parents, and the fact that Fox was forced to publicly retract its reporting on the same story. Cars.com was first to pull its commercials on Tuesday. Later that day, Hannity announced he would take a break from talking about the Seth Rich story entirely. On Wednesday, six more advertisers followed Cars.com’s lead and, soon after that, Hannity announced he was taking Thursday and Friday off. But Hannity is not seeing the same advertising hemorrhage that drove out his former colleague, at least not yet. A representative of Fox News would not comment on the advertising defections, telling TheWrap that Hannity is out on a scheduled vacation and that he will be back on the air Tuesday. “Like the rest of the country, Sean Hannity is taking a vacation for Memorial Day weekend and will be back on Tuesday. Those who suggest otherwise are going to look foolish,” a network spokesperson told TheWrap in a statement. 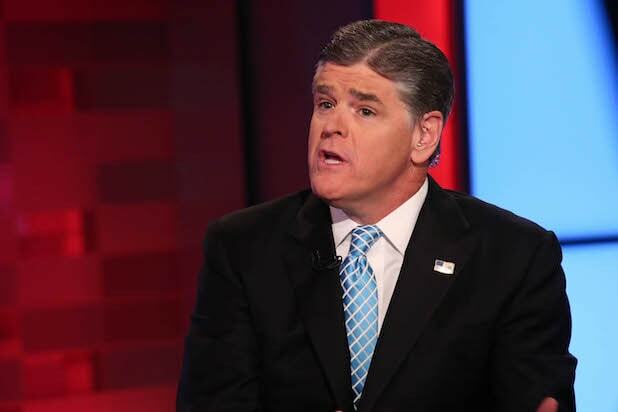 TheWrap reached out to all 32 of Hannity’s current primary advertisers, according to a list published by Media Matters, a progressive media watchdog. And while many who spoke with us said they are monitoring the situation, all said they would not be withdrawing advertising at this time. “We have been receiving an overwhelming amount of feedback regarding our ad placements on Fox News and when our ads air, specifically during the Sean Hannity Show. We wanted to address these concerns immediately, however, there are a few things people need to know. Unlike a general advertiser, PC Matic is a direct response advertiser. What this means is, we place orders containing rates for the air time that is remaining after the general advertisers have chosen their ad spots. Therefore, we are not guaranteed any air time at all. We simply receive whatever ad spots are available and within our order. Also, for some of the TV providers, we place orders based on what is called a ‘network cluster.’ For example, there is a ‘News Cluster’ that contained a predefined list of cable news networks such as Fox News, CNN, MSNBC, etc. So, when an ad spot clears for the cluster, we air at the same time on all of the networks within the cluster. For example, an ad that is on at 9:20 p.m. EST on Fox News, will also be on at 9:20 p.m. EST on CNN and MSNBC. “We think it’s important to state upfront our advertising has never been drawn along political lines. We advertise across the full range of the political spectrum because, frankly, our customers fall along the full range of the political spectrum. And as a brand that strives to reflect what’s best of America, we are ardent supporters of free speech. That said, we recognize on occasion people say things some find incendiary. And, when someone we advertise with articulates views that prove particularly decisive or particularly incendiary, we take such comments seriously as they can prove distracting, or at worst, damaging, to our brand and our mission. We have made the decision to cease advertising where we’ve felt necessary though recognize it is our customers who are often the ones collaterally affected. The following primary advertisers did not immediately respond to TheWrap’s request for comment. We will continue to update the list. Is Fox News Cleaning Up Its Act? Or Just Trying to Make the Murdochs Richer?